made out of durable, waterproof, Oxford Cloth material, Extremely Durable and Lightweight. It is sturdy enough so your pet can't tip it over. It will make your pet feels more cozy at home. If you have puppies that want to let them get fresh air but not directly on grass, this pet yard pen would be a good choice for small dogs, kittens and rabbits. Size information:Small=29*29*16.9inch .Medium=35*35*22 inch.Large=45*45*23 inch .please check the last size table in the last pciture. and Please make sure to measure your dog for accurate sizing before purchasing to ensure the perfect fit. Waterproof and Breathable Material:made out of durable, waterproof, Oxford Cloth material, Extremely Durable and Lightweight. It is sturdy enough so your pet can't tip it over. And keep your baby safe . 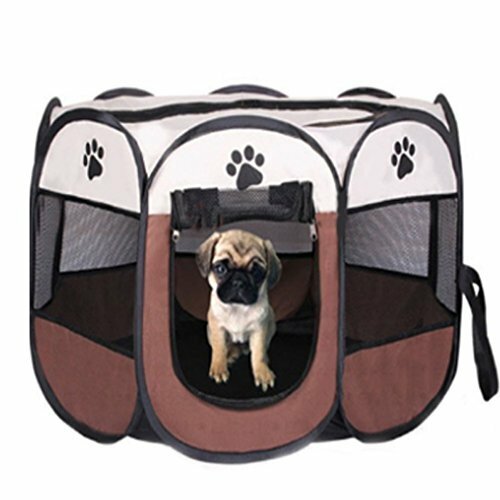 Our pet playpen are very easy folded up and stored flat and very convenient carry. so it's best chooice for indoors, outdoors, traveling, camping,and more! Ideal for Small and Mudiem Dogs ,Cats ,Rabbit and more pet animals.It applies throughout the year,Fit for car's front and back seat.please contact us if there is any problem, we are committed to your satisfaction 100%!! If you have any questions about this product by DDPet, contact us by completing and submitting the form below. If you are looking for a specif part number, please include it with your message.